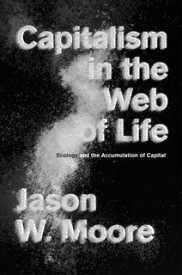 McKenzie Wark gets at some very important issues in what we might call “the ontology of the Anthropocene” in this review of Jason Moore’s book Capitalism in the Web of Life. The point here is that the natural sciences need to be given their due — not as unproblematic “discoverers” of reality, but as activities that despite their “contamination” by social relations nevertheless retain something from their contact with the nonhuman, material worlds they study. Wark makes this argument through reference to two axes that, he notes, tend to get confused: the “substance/relations axis” and the “metaphoric/metonymic axis.” Like the process-relational philosophy I have championed here, Moore’s approach (and Wark’s) is relational rather than substantivist. But, according to Wark, Moore’s is also metaphorical in its substitution of a master metaphor — dialectical interaction — for Descartes’ binary estrangement (of mind and matter, nature and culture, etc.). In the process, the underlying binary duality remains intact. Missing so far in this discussion is the third element, Peirce’s symbol, which represents not by resemblance nor by contiguity, but by habit or regularity. A symbol is less a thing than a kind of thing — it is, in fact, a kind. It, like the others, is also an active process — meaning always in the making, rather than meaning made. In this sense, Peircian semiotics is metonymic through and through, in that meaning or reference is always being transferred, always on the move from a here to a there. The difference is that the transferral can be a substitution (icon/metaphor), a causal interaction (index/metonymy), or the development of a new habit and regularity (symbol/sociality). I add “sociality” there to make the point that the social is, by definition, not one side of a binary opposed to the natural. The entire process is social, or becomes social in the establishment of regularities between entities (or signs, since for Peirce, all humans and other entitites are signs — at once virtual, actual, and symbolic-logical). If Moore is substituting one metaphor for another in overcoming Cartesianism, and Wark is arguing for ways to think the human-nature relation as metonymic networks, translations and transferences (akin to Haraway’s cyborgs and Actor Network Theory’s hybrids) of something that is both more unified and more complex than a binary can encompass, the third approach I want to suggest is a kind of meta-metonymic one that sees substitution, transference, and pattern-making occurring all at once. Hence, there are (1) patterns that keep being repeated because they resemble basic propensities built into the nature of things — such as those reflected in the binaries that we seem so unable to jettison (self/other, us/them, up/down, male/female, mind/matter, nature/culture), (2) patterns that get generated through actual displacements in material relations (such as the changes that occur with specific technological inventions — the internal combustion engine, and so on), and (3) patterns that emerge in and through systems of pattern-organization that both precede, accompany, and creatively depart from from the real changes in relations over time. The Anthropocene marks a recognition that the current political-ecological formation is unsustainable and rapidly endangering any humanly-viable futures. But the difficulty of thoroughly thinking the shift out of it to something more viable is a difficulty that will not be overcome until we have arrived at the “elsewhere” that will itself be indicative of that shift. We won’t know it until we have emerged out the other side. What I am suggesting is that neither a substitution of metaphors (a la Moore, in Wark’s critique) nor an empirical study of how things are all entangled in complex and changing relations (which is what Wark at times seems to be suggesting, and what Moore’s work actually helps us do) will alone do the trick for us. What I’m getting at is this, but considered a bit more broadly. Placing all of our acts — those of conceptual doubling and those of transference — under scrutiny, and indeed in abeyance (while continuing to think and act), is part of what I think we will need to do before the next act, the shift from the (ill named) Anthropocene to whatever follows, will have been enacted. This will involve a lot of creative metaphorization and translation, as well as a lot of experimentation in thinking and in practice, without guarantees of any particular results. The next collective move in that project may be how the nascent world community deals with the coming Paris climate summit. More on that soon. I am writing a response / update to Wark’s Gamer Theory. Wark has backed the Project. Help me get the word out? Hmm it looks like your blog ate my first comment (it was extremely long) so I guess I’ll just sum it up what I wrote and say, I’m thoroughly enjoying your blog. I as well am an aspiring blog blogger but I’m still new to the whole thing. Do you have any tips for newbie blog writers? I’d definitely appreciate it.